Is there anyway to use php/scripts that wish to use the users microphone? Since there is no way to ask user for permission, I am stuck. Well, microphone support through WebRTC will be better handled in ExeOutput 2019.1 (should be available in a few days). We’ll integrate it into the general demo that ships with ExeOutput. It lets you record audio with your microphone (default one) and save the recording as a WEBM file (audio format). Not sure if possible, but having ability to place spoken words into a text area would be very useful. For instance, we are working on a software for a dyslexic program which users speak words instead of writing them. Yes, we should got some new updated CEF files, so it took more time to use them and make usual testing. Is new version going to happen anytime soon? Just need to know so can make other arrangements on a project. We are fixing some problems on very large screens with very high DPI. That’s why we got some delay. Hopefully, it will be released on the next week. 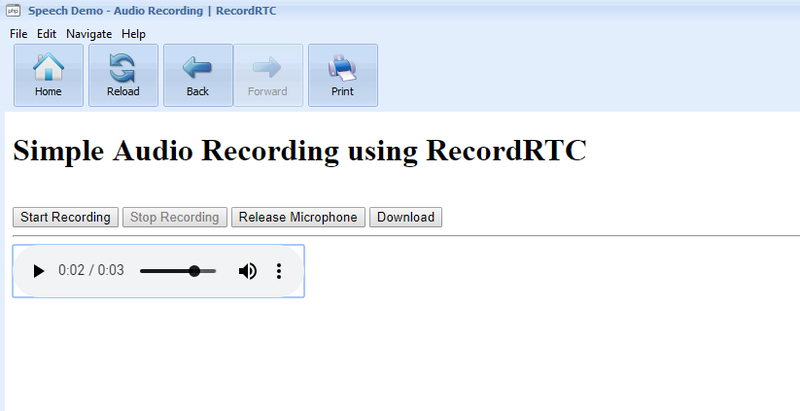 Released with a demo about recording audio with microphone and WebRTC. Confused what you mean “unless you have configured ExeOutput to serve pages in simple HTTP”? Could you exaplin this so an old mind can grasp and use. Maybe example?